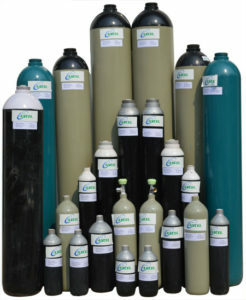 We are a renowned Nitric Oxide gas dealers and suppliers in India. This Nitric Oxide gas is sometimes also referred as Nitrogen Oxide or Nitrogen Mono oxide gas. It is basically colorless gas and used majorly in chemical Industry. Nitric oxide is mostly generated undesirably during burning of fossil fuel in power plants and during combustion of fuel in IC engines. During the burning / combustion process, if the presence of air or temperature is much more than what is required for completion of the process, in that scenario NO is produced. NO also gets produced during lightning at the time of thunderstorm. A very small amount of NO is available in every human body as well. It facilitates few major functions of human body. Generation or presence of NO in a quantity more then what a human body / living beings can absorb is highly undesirable. NO is undesirable because it is one of the reasons for depletion of Ozone Layer. All the major countries have put on strict rules to fit catalytic converters in every automobile, because IC engine is one of the major source of NO generation. A catalytic converter curbs the generation of NO by reconverting it into O2 and N2. In Chemical Industry for Nitric Acid synthesis. These are some of the common uses of Nitric Oxide. There are various other ways in which Nitric Oxide can be used in a particular industry or process.